Malaysia’s Gross Domestic Product (GDP) is on track to a 5% growth this year, up from 2016’s 4.2%. And the Kuala Lumpur Composit Index (KLCI) has also expanded 7%, thus far this year. Gerakan president Mah Siew Keong said the two economic indicators showed Malaysia’s economy “is growing healthily as opposed to the prophets of doom”. Mah, who is also Plantation Industries and Commodities Minister, said the country’s biggest export product, palm oil, had also expanded by 31%, from RM24 billion to RM32 billion. “Palm oil exports also showed a strong 27% growth. India and China are our No. 1 and 2 importers respectively. “We are now aggressively pushing two countries, Iran and the Philippines, for stronger growth in palm oil exports,” he added. Speaking at his party’s Hari Raya Open House in Kompleks Penyayang Bakti, Bandar Sri Damansara, Mah said Gerakan had always fulfilled its obligation to stage festive events to help forge national unity and harmony. “We are a multi-racial party and we are therefore committed to serving and protecting the interests of Malaysians,” he added. He said the party’s Hari Year Open House was not staged in the Gerakan headquarters in Pudu Ulu but in Bandar Sri Damansara because “Tuan Syed Abdul Razak Alsagoff is our nominee to contest on a Barisan Nasional (BN) ticket in the coming 14th General Election (GE14)”. PETALING JAYA: Raja Sara Petra, the daughter of blogger Raja Petra Kamaruddin, has joined Gerakan and will oversee the party's plans to be part of the National Transformation 2050 (TN50) initiative. 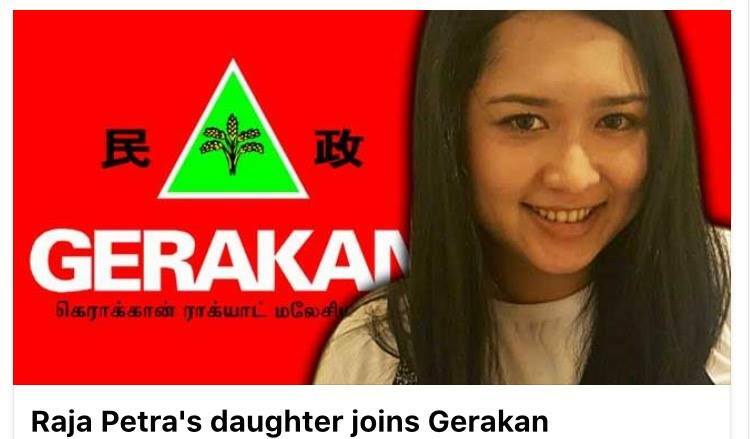 Raja Sara, 29, announced her induction to the political party at a Hari Raya Aildilfitri open house organised by Gerakan at the Penyayang Bakti complex in Bandar Sri Damansara on Saturday. She said she hoped to inspire youths to come out and do something for the country. "Many youths have been complaining on social media like Facebook that they are unhappy with the situation in Malaysia. Yet, we have seven million people who are eligible to vote, but still don't. "You love your country, so this is the time (to show it). It only takes an hour to come out and vote," Raja Sara said. She explained that she had been with Gerakan for less than a year. "It's a multiracial party, and I believe in a multiracial Malaysia," she said, when asked why she decided to join the party. Gerakan president Datuk Seri Mah Siew Keong said he has assigned Raja Sara to take charge of his party’s contribution to the TN50 initiative. "We in Gerakan are very proactive and we work very hard. We are formulating a plan to be part of TN50. "We encourage more youths like Raja Sara to join our party. We want young people who are open minded and represent the 'Bangsa Malaysia' ideology to contribute to our party. "The youths will definitely bring more ideas to TN50," he said. Raja Sara said she is still engaged in discussions with party leaders and Wanita Gerakan to chart a roadmap to TN50. "So far nothing has been set yet since I'm still very new to the party," she said when asked if she would be holding any post in Gerakan. Mah also imparted some words of advice to Raja Sara. "Politics is not easy, but if we are here to serve the people and make the country better, it will be very fulfilling. "Gerakan is a good party to achieve these objectives," he said."